I never considered myself a "city girl", but maybe I am. I cringe at the site of a mouse, snake, anything in the rodent family, I don't trust birds, and most of these if not all of these animals I have only seen in a cage at the pet store. Robert on the other hand....is an animal lover. ALL animals. "They are all God's creatures, and they all have a right to be here." This may be true, but classifying animals like these as "cute", is just GROSS. We were talking about animals, and I said I don't trust birds...and he laughed at me. He thinks I'm nuts. So I threw out...." You probably think Armadillo's are cute".......expecting an "eeewww...nooooo...not those." What do I get? "They are cute!" I couldn't believe my ears. 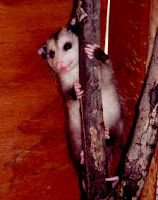 So I move on to the other gross rodent pictured up there, the opossum. "Baby opossums are cute" he says! I give up. There's no changing the fact that I'm a city girl, and he's a country boy. Regardless....there's nothing "cute" about an Armadillo, or an opossum. I'm not backing down on that one.